On January 24, 2002, the Board of Trustees of the Lorain County Historical Society voted to enter into negotiations for the purchase of the former Horace Starr mansion, located at 284 Washington Avenue, for the purpose of creating a new Lorain County History Center. The purchase was completed in July of 2003. The plans for this new museum space were on display during a reception held for LCHS members and guests in October of that year. 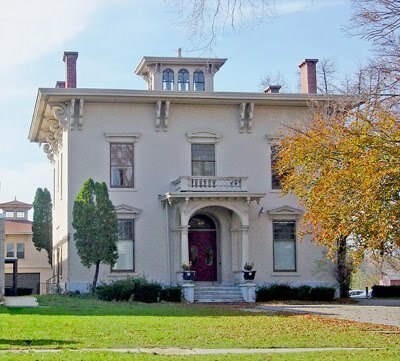 This large Italianate-style mansion, built in 1857, is the oldest surviving structure on Washington Avenue, Elyria, Ohio. Both the house and its carriage barn are listed on the National Register of Historic Places. This is one of the two most significant decisions ever made in the 123-year history of the Society. The acquisition of The Hickories in 1975 has provided an important base of operation for their work since that time. The development of this new property offers a tremendous potential to expand LCHS's services to the citizens of Lorain County. LCHS is now able to fully embrace its mission by creating a History Center where it can preserve, interpret and present the history of all of Lorain County. The LCHS Board approved a $1.6 million Capital Campaign to finance this important cultural facility. The co-chairs of the Campaign were Fred Pond, CEO of Ridge Tool Company and Ken Rothgery, Esq. of Rothgery and Associates, LLP. Important contributions were pledged from local companies including Ridge Tool Company, R. W. Beckett Corporation, Bettcher Industries, and others. Funding has also been received from the LCHS Board of Directors and staff along with numerous private donors. Late in 2003, the Society was the recipient of a $300,000 appropriation from the State of Ohio through the efforts of the late State Representative Jeff Manning. An additional $200,000 appropriation from the State was awarded in 2008 through the efforts of State Representative Matt Lundy. In July of 2011, 100% of the original Capital Campaign goal was achieved. The Lorain County Historical Society currently has over 500 members and is governed by a Board of 14 Directors. It is designated by the IRS as a 501(c)3 non-profit educational organization and operates on a current annual budget in the range of $175,000. Using a small staff and dedicated volunteers, the LCHS collects and preserves numerous artifacts and archives significant to the county's history and provides an extensive educational outreach program to schools as well as to many community organizations. In addition, The Hickories Museum hosts over 2000 visitors annually.